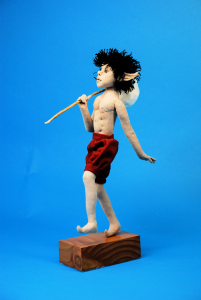 The second part of the An Elf Named Stretch was published in the March 2011 issue of Soft Dolls & Animals magazine. This article includes his clothing with shirt, vest, pants, hat, and boots. Since the patterns in the magazine are printed on both sides of the paper, we have put the original clothing patterns up on the web site so you can download them for printing on one side of the paper. You can print them on regular paper or on card stock (if your printer will take card stock) to get instant templates without having to trace patterns or paste paper printouts onto file folders. Both the Stretch body patterns and clothing patterns are in the same file that you can download by clicking Mimi’s Complete Stretch the Elf Pattern Sheet. We expected the article on how to needle model his chest would appear before the clothing. It may appear in a future issue. If it doesn’t, we’ll publish it on the web site. Our Christmas sale is ending on February 15, 2011. We will be discontinuing the Mimi’s Child Interactive Video pattern. If you are a pattern collector, and you want this one, now is the time. We have hundreds of out-of-print cloth doll and animal patterns by other designers and dozens of out-of-print books. I’m so busy designing my own work at this point that I will never get to any of them. 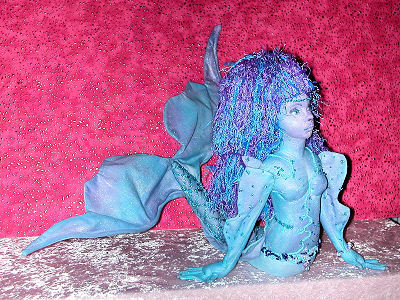 We would like to auction them off to other dollmakers and pattern or book collectors. Fantasy Fashions 1981: Pattern for ADULT human for Renaissance Maiden. 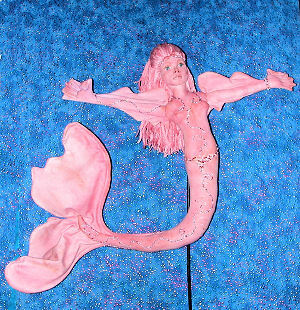 Includes instructions for adult, girl’s large, and girl’s medium and small variations. Includes guide for M’Lady’s Bonnet, Wizard’s Hat, Jester’s Hood, Renaissance Cap, Cindy’s Bonnet, Flat Cap, Renaissance Cap, Mob Cap, Bag Hats. Also includes 2 hand written pages by the designer on how to alter some parts of pattern to create another style. Victorianna Petite by Elizabeth Biship, 1990: 20-inch cloth doll with ball gown, high-heeled boots, lacy undies, Gibson girl hairdo. Flexible, posable limbs with another strapless ball gown that has bouffant skirt and petticoat. Miniature satin ribbon rose trim. Color cover picture. Muslin body is embellished to look as if she is wearing Victorian underwear. 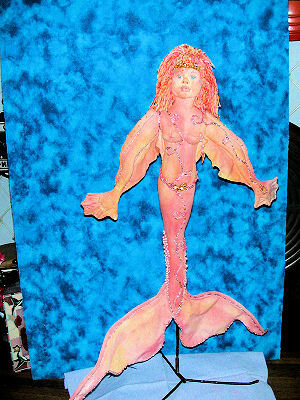 She looks great just in her unmentionables seated on shelf in bathroom or bedroom. Other clothing patterns available. 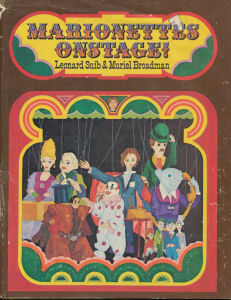 Marionettes Onstage by Leonard Suib & Muriel Broadman 1975: Divided into three major parts. 1) The New Marionette – words, drawings and photos show how to make and manipulate a new type of figure that has cardboard as its base — lightweight and perfectly balanced. You don’t need a workshop or complicated equipment. 2) Becoming a Puppeteer – presents a full discussion of playscripts, performing, stages, scenery, props, music, sound effects, marionette magic, multi-media, putting on the show, and safety. 3) Puppet Theater Management – useful suggestions on how to save time and money, business procedures, professional ethics and affiliations, etc. 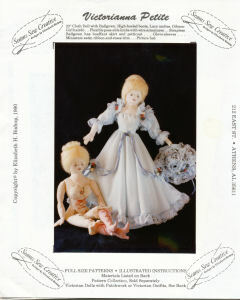 Mold Making with Martha Armstrong-Hand 1992: The famous NIADA artist tells you in 32 pages how to make plaster molds for porcelain dolls. If you can think of any way we can get these patterns and books from us to you, let us know. We don’t really have time to run a silent auction on the web or to mess with EBAY where everybody complains a lot. If you know of a better way, or want to volunteer to help us, let us know as soon as possible. Thanks. Incidentally, if you sign up for an email subscription using the button on the bottom right of the screen, we’ll tell you by email every time something new is posted.